Sherida Stewart » Blog Archive » TUESDAY TEA with Kira Brady launching HEARTS OF CHAOS! « TUESDAY TEA with Kira Brady & chatting about HEARTS OF SHADOW! TUESDAY TEA with Kira Brady launching HEARTS OF CHAOS! WELCOME TO THE KIVATI HALL TEA ROOM LOCATED IN POST-APOCALYPTIC SEATTLE! Please join my daughter-in-law, Kira Brady, and me for a special tea in the conservatory of Seattle’s Kivati Hall, as featured in her third book of the Deadglass series, Hearts of Chaos, releasing today. We’re sipping peppermint tea. Please help yourself to buttermilk scones and triangle open-face sandwiches spread with gingered goat cheese, topped with cucumber slices. Then have a special Kivati Hall cinnamon and sunflower seed cookie. The recipe for the cookies is at the end of this post. Now to tell you about Hearts of Chaos! Brilliant conclusion to an unforgettable paranormal romance series. Yes, brilliant writing! I felt I was walking among the mists and myths of a very different Seattle created by Kira Brady. Lucia and Emory are intriguing characters as they develop strength and courage during their story of saving their world and of finding faithful love. If you enjoy steamy, paranormal romance, with intricate world-building and complex characters, you will want to read the Deadglass Trilogy. I’d suggest starting with the Hearts of Fire prequel novella of Alice and Brand, then the story of Kayla and Hart in Hearts of Darkness, followed by Hearts of Shadow featuring Grace and Leif, then ending with Lucia and Emory in the amazing Hearts of Chaos. Each book is a separate, fulfilling romance, but it’s interesting to see the development of the alternate Seattle, with the blending of different, enchanting mythologies, as each book unfolds. Watch for mention of the Deadglass (spyglass) in Hearts of Chaos…..intriguing to see who possesses it last. Hmmm……? For more about Kira Brady and her Deadglass Trilogy, visit her at www.KiraBrady.com. There you will find links to her books, and some of the ebooks may be available at special prices. Interesting photo: I took this picture on the shoreline of Puget Sound near Seattle. Now I’m wondering what stories these two eagles may be hiding. 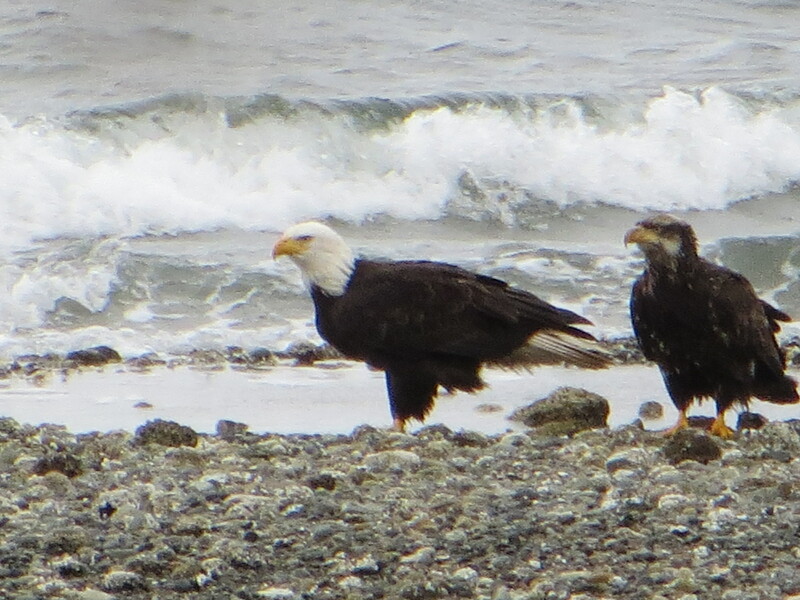 Eagles on the beach near Seattle. Cream shortening and sugar together. Beat in egg. Stir in molasses. Add flour, baking soda, salt, and cinnamon and stir until well combined. Mix in cinnamon chips and sunflower nuts. Roll dough into two 9-inch logs (about 1-inch in diameter). Refrigerate dough or freeze. TEA ROOMS Kira Brady and I have enjoyed afternoon tea at many lovely tea rooms……The Brown Palace, the Jazz Bouquet Tea Cafe, The Georgian Restaurant, and the charming Wildflower Tea Room Café pictured below. We still have many more on our list to enjoy in the future. Do you have a suggestion of a favorite tea place? 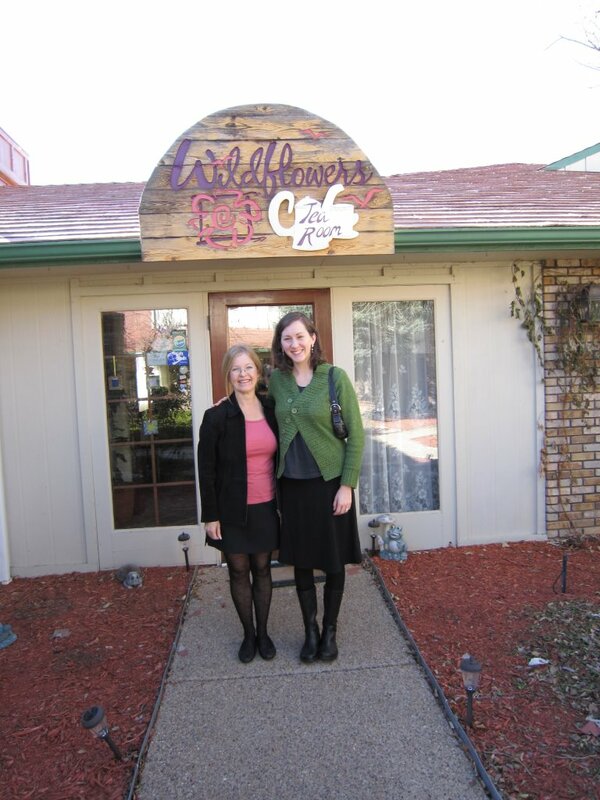 Tea with Kira Brady at Wildflowers Tea Room. This entry was posted on Tuesday, March 4th, 2014 at 9:39 am	and is filed under books, Food and Treats. You can follow any responses to this entry through the RSS 2.0 feed. You can leave a response, or trackback from your own site. Cookies and tea on a day like today. Brilliant! Hi Sarah! Good to see you here. I’m keeping in mind your 2015 conference. Enjoyed our meeting at ECWC. Please try a scone, too. Hello ladies! I love a good series. I just downloaded Hearts of Fire. Can’t wait to read it! Sherida, I enjoyed the eagles picture and the recipe..
Hello Donna! I see your name on the Speedbo list, so I’ll pour you a cup of strong Earl Grey tea to fortify you for your word count. I’ll set out extra cookies, too. 🙂 Thank you for stopping by! Happy writing!!! No computers were harmed in the 1.433 seconds it took to produce this page.